Good result with the shifter, not so great to hear about the speakers. It's no problem for you as you're doing the whole system. I'm not. Obviously a 4" speaker is never going to rattle my insides but I'd hoped they'd be better than the old stuff even when just doing a straight swap. I will admit to testing it with Guns'n'roses, where there was really no appreciable difference. I then went for a drive to test the gear-shift and had Classic FM on, which sounded good - nice and clear. I didn't test the "before" using that as a source however. The blue's don't quite match, but I guess they're close enough. I've spent the last few evenings reading from page one. You're certainly taking a different path to most, and good luck to you. Just buy a standard UK plate. 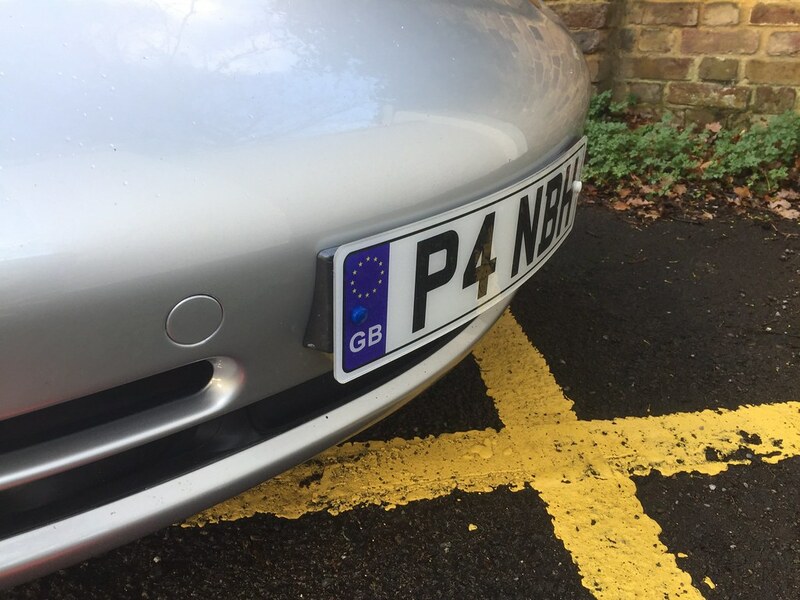 It is a standard UK plate- just a bit shorter. Meets all legal dimension requirements. Glad you’ve enjoyed it so far, it’s going to get even sillier. I meant one without the blue on so you don't habe the colour match problem. Failing that, colour it in with a blue permanent CD marker should get a shade nearer. The amp replaces the stock Nokia, and is located using a bracket created for the purpose. No wires were cut, everything was connected using new plugs to the stock wiring. Does anyone know which combination of width and offset of BBS E88 would fit in my arches without modification? The LM's you have linked, the fronts will fit, but the rears would not from an offset perspective. - Would stick out 30mm more than your current wheels. From a max width perspective 8.5 front & 11 rear will work, its usually the tyre that causes the rubbing. If you go 8.5 you will need a 235 which works, and 11 would take a 295 which again works. If you happy with what you current run look for 8 & 10, personally I feel anymore and your carrying unnecessary weight. - An 8 will take a 245 and a 10 will take a 295 which is more than enough tyre for a 996. Offsets are the challenge, you need to get as close to what you current have, so circa ET50 front and ET 65 rear, A little either way is no big deal. BBS E88 are as good as it gets, LM's are cheaper and look similar, E28 are best avoided as they have a habit of cracking. Higher offsets can be reduced by the use of spacers, lower offsets can not be increased. So clearly anyone who has run BBS LM's on their car has made those fit, the question is how much work was required to do so? I also think that that is too much tyre. I'm guessing that LM's are cheaper than E88's though. "My BBS E88 rims are 8.5 x 18 front and 10.5 x 18 rear, the offsets are not stamped in to wheels however I was advised by Gert at Carnewal that they were ET40 front and ET52 rear. My arches are not rolled and the wheels fit perfectly with the OEM spacers removed." 8.5in et45 and 10in et40 will be perfectly in line with your arches. Those sizes below will sit 4mm further in on front and 16mm (10.5) or 2mm further in rear than the spec above. That's the beauty of 3 piece wheels is that you can change barrel and outer rims to get the width you want. I know you seem focused on BBS but worth speaking to Image wheels in the UK. My old ones were essentially custom built to spec and they have loads of different face designs. To see how extreme it's possible to go, the picture below is a US car running an 11" et38, lowered, rolled arches, 2.5* of camber and a 275 rear tyre. 11" et 65 is the same fitment as a 10" et 53 (on the outer side), so will fit easily without any modifications... I know someone running OZ's in that size on a lowered 996.1 without any modifications and there's no rubbing. A 11" et 55 would be close to perfect, but might need arches rolling, depending on tyres... some tyres have a squarer side wall than others. +1 you are going to need one after the 29th March anyway. An update on the LM's - there are more options than I had thought. So the 8.5 would be (head starts to hurt) 6mm further in than my current 5 spokes, and the 10 would be 15mm further out? I admit I struggle with the offset stuff. I picked the car up today from Precision, where I dropped it off just before I flew to the US for a couple of weeks. Precision has finished off the stereo install and sorted out the little flaps that attach to the clamshell and make the rear look neat when the hood is stowed - something that the place that fitted the hood has tried and failed to resolve twice now. It turns out that this task was much more significant than had been thought - more on that follows. 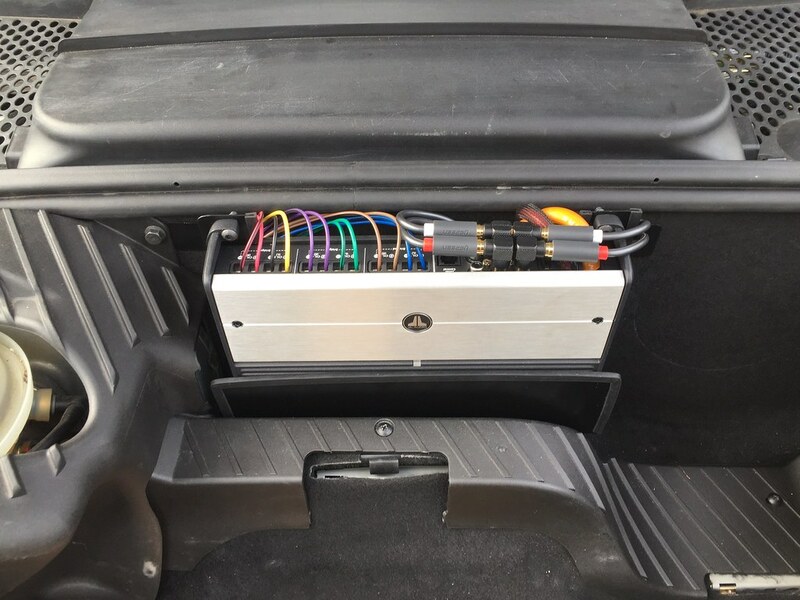 First, the stereo - I'd fitted the dash and the rear speakers, sourced plugs that connected to the chassis loom, and had created a template for the amp bracket, only leaving the majority of the hard, fiddly work for someone else to do. That included pulling the door cards off and fitting the woofers - during which task it was discovered that my door membranes had holes in them, and the passenger wing mirror was leaking into the door - all fixed now. 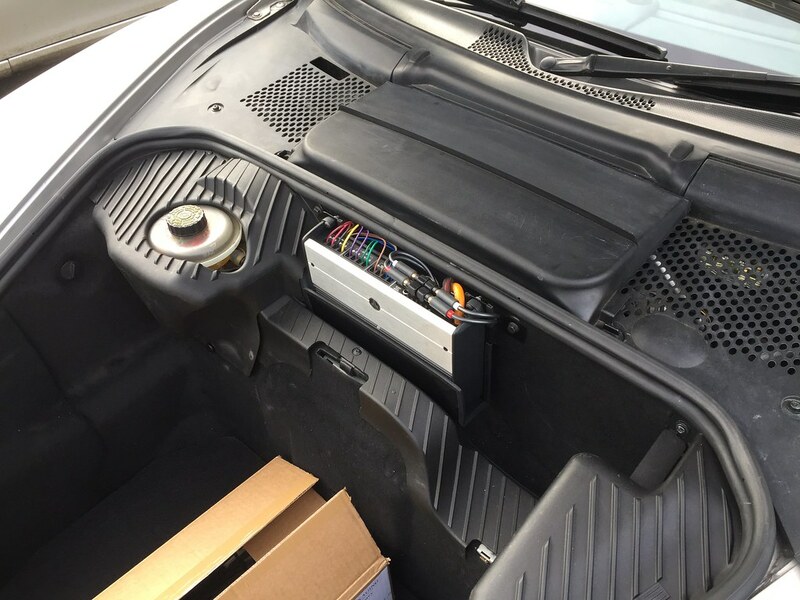 And you have to know that there should be a different amp there in order to know that this wasn't fitted by Porsche, which is absolutely what I was after. I retained the Becker Cascade Pro head unit as it looks period correct, and is a high quality unit (although I always think the radio reception could be better). We did try to fit a sub, but after an exhaustive search a space for it could not be found - cabs have a lot less storage space than coupes. So, what does it sound like? It sounded good, very clear, powerful, and when I discovered that the fader control also had a significant impact on the utilisation of the woofers (I suspect due to the amp making six channels of output from four channels of input) extremely configurable in terms of bass response. I have set the crossovers for the channels, with the woofers running up to 200 Hertz and the mids+tweeters doing 200+, I suspect that this is probably too low but can play around with this further. I initially tried 500 as the crossover point, but it didn't sound hugely different to me when I dialled ii down to 200 so I left it there. All advice on this stuff welcomed! I also fitted a lead to the aux pins on the back of the Becker so that it can plug directly into my iPhone (lead emerges in the cubby under the elbow rest, so phone is dropped in there), or uses a Bluetooth bridge that is plugged into the same cable if I want the phone on the dash for navigation. I think the new speakers and amp sound great, and I'm glad that I (did some and Precision the rest) of this winter project. Clamshell/flaps - this has been a pain, returning the car to D:Class again and again, paying for said additional work, and each time it's failed. I had to get the roof struts repainted as the flaps, seized in place, had scratched them. I did have an appointment with D:Class for them to have another go, but frankly I'd lost faith in their ability to fix what they'd broken, so I asked Precision to sort it whilst I was away. It transpired that Porsche had changed from the early hinges to a new, totally incompatible with the old flaps type of hinge, so D:Class had been trying to fit the wrong parts - although as a Mercedes specialist I guess they can't be blamed for not knowing that much about 911's. £500 worth of hinges and hour upon hour of installation and setup I now have flaps that work - which is great, a weight off my mind. Just a shame that the ones which worked fine with the old roof didn't work with the new one. Final thought is that it took maybe 3 seconds for a huge smile to appear on my face when driving home - I'd forgotten how much I love driving this car, and how rewarding it is even when the roads are, in places, partially flooded. Now I just need to find out which bag Precision put my Imperial hex-wrench in (for adjusting the height of the Function First gear lever).